Size: Perforated souvenir sheet size: 115 x 150 mm (stamp size: 42 x 52 mm). 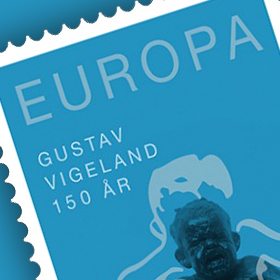 Imperforated souvenir sheet size: 115 x 150 mm (stamp size: 42 x 52 mm), available only as part of a philatelic album. 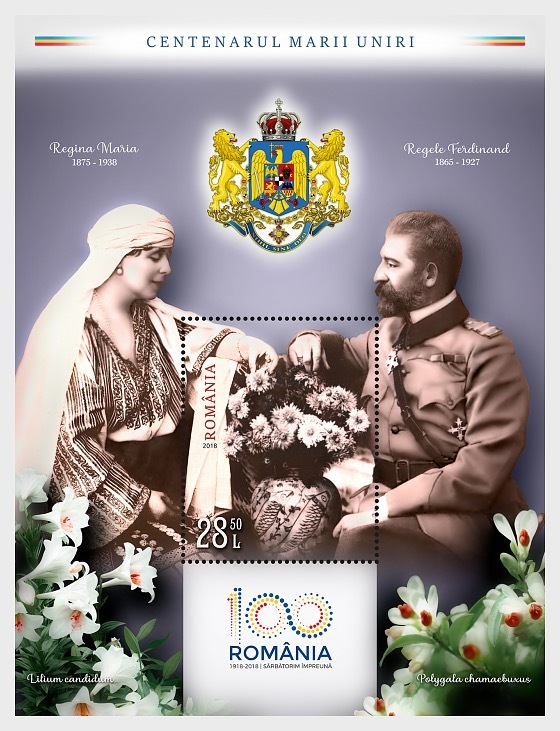 To celebrate the great historical achievements of Romanians of 100 years ago, Romfilatelia introduces into circulation the postage stamp issue Centenary of the Great Union. 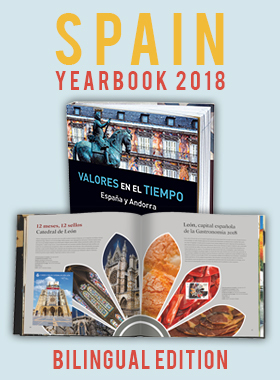 The philatelic issue consists of a perforated souvenir sheet with the face value of lei 28.50, illustrated with a picture of King Ferdinand I and Queen Marie, in a intimate posture, looking at a vase with flowers. On the souvenir sheet are also illustrated two species of flowers appreciated by the sovereigns of the Great Union, namely Polygala chamaebuxus, prized by Ferdinand I, who remembered his childhood, and Lilium candidum, a lily beloved by the Queen Marie, whom he also painted. Another element of the souvenir sheet is the coat of arms of the Greater Romania. The Great Union of 1918 was the result of a country project to which the whole nation contributed, from the politicians and officers who managed the situation created by the World War I, to the peasants who fought on the battle field and defended their Homeland with the gun in hand. When the war broke out, the Romanians were widespread in three countries – the Kingdom of Romania, Austria-Hungary and Tsarist Russia. The world’s conflagration has brought the Romanians everywhere difficult attempts: concentration on the front, placements in camps, refugees, illness, famine etc. However, at the end of the war, the situation returned to their favour and the possibility of unification into a single state was created. The first province to unite with the Homeland was Bessarabia. The eastern part of the historical Moldova reached Russia’s borders in 1812, after the defeat of the Ottoman Empire in a war with the Tsar’s troops. In February 1917, the Tsar was expunged by the revolutionaries, and the peoples of the empire began to demand national rights. In November 1917, the Great Congress of the Moldovan Soldiers decided to convene a Country Council, an assembly that was to be elected and representative of all nationalities and social groups. The Country Council firstly proclaimed the autonomy of Bessarabia, and later its independence. Overwhelmed by the troubles caused by the Russian and German soldiers, the Bessarabian leaders demanded the intervention of the Romanian army, which crossed the Prut and stabilized the region. Aware that the only solution for Bessarabia was to unite with Romania, the leaders of the Country Council began negotiations with the Government in Iasi. The Romanian authorities proposed the debate on the issue of the unification in the Country Council meeting, on March 27th, 1918. Ion Inculet, the President of the Council, and Alexandru Marghiloman, the Romanian Prime Minister, spoke at the opening of the works. The unification was approved by a majority vote, being accepted immediately by Marghiloman, and later by King Ferdinand I.
Iancu Flondor, Sextil Puscariu and other Bukovinian patriots initiated the political organization of the Romanians and demanded the unification with the Kingdom of Romania. Due to the riots caused by the Ukrainian nationalists and the Bolsheviks, the Romanian National Council called for the intervention of the Romanian Army in Bukovina. General Jacob Zadik and his soldiers entered Cernauti on November 11th, restoring order in the city. The nationalities of Bukovina were summoned, on November 28th, to a General Congress, voting with the overwhelming majority for the “forever” unification with Romania. We would like to thank the National Archives of Romania for the support granted for the achievement of this postage stamp issue. 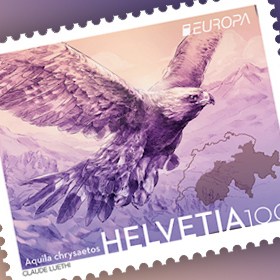 The philatelic album is created into a limited edition of 387pieces and is equipped with the imperforated souvenir sheet of the issue and the First Day Cover equipped with the perforated souvenir sheet of the issue, with „first day” postmark clearly imprinted, with gold foiling, both products being numbered from 001to 387, alongside a CD containing a documentary film dedicated to the Great Union.